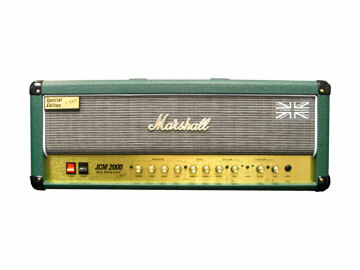 The Marshall DSL100 dual super lead originated from the Marshall factory in the UK, but later it migrated to other shores for manufacture. How does the DSL100 stand up these days and is this now ageing guitar amplifier worth buying? Before I had the Marshall TSL100 I had this amp. It is a dual super lead DSL100 amp that comprised of two basic channels clean and drive and mine as you can see was a 'special edition' from Marshall. I bought it brand new for around £700 ($1150) if I remember correctly so it was a mid priced amplifier but I liked the green tolex that the special edition had. In every respect, other than the green tolex covering this amplifier was exactly the same as the standard black tolex amp. These amps can be picked up second user for little money (around £300 or $450) these days from sites like eBay so in some ways they are a bargain. I would recommend you find one that was UK made (it says on the amp where they are made) so there is no question about quality. This dual super lead amp seemed to be marketed as a 'budget' amp and certainly had that feel to me but hey it's a Marshall right? There's all the usual stuff we'll get in to later in the actual review such as effects loop etc. but how did this amp sound? 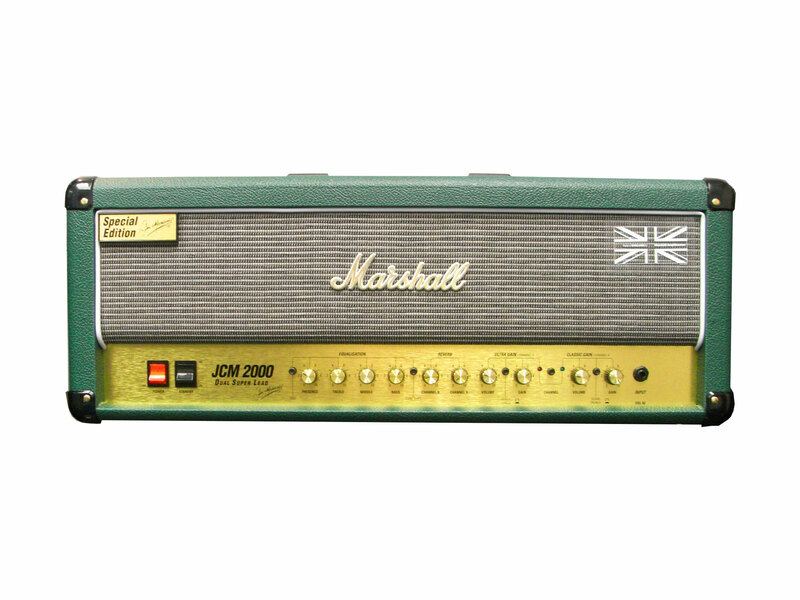 If you have read the review about the JCM2000 TSL100 that I wrote then you could think that I liked this amplifier a lot? After all, the DSL and TSL are basically the same amp but the TSL has one extra channel right? For me the DSL was worlds apart from the TSL100 and that was one of the reasons I sold it to buy the TSL that I later used extensively on my 'Eniac' album. This DSL was never used for any recordings. Indeed I don't even have any real video footage. What's wrong with the DSL100 then? I don't think there's anything 'wrong' with this amp (but I am not sure of the current non UK built ones re reliability and tones) but for me it never did actually sound that great and 'felt' wrong when I played it. Sure it's a tube amp with EL34's in there but I tried many things to resolve that problem of the feel, but ultimately this amp was sold. All of that is subjective though, what I don't like you might! But I do have lots of practice with amplifiers so do bear that in mind. The amp features a 'classic gain' and what Marshall called an 'ultra gain' channel, eq and reverb as standard. The classic gain channel was not bad really and useable for guess what? Yep, classic rock!, but the ultra gain channel always seemed to never have enough drive on it to get 'that' later sound we all know Marshall amps do have in their DNA. I have a sneaky feeling that this was one of the primary reasons for the development of the TSL100 with that third channel that eats the DSL for breakfast. Nevertheless, the ultra channel could be boosted with things like a TS808 booster pedal which the amp did not seem to dislike. This review shows inside as well as the amp generally and is being written currently and will not be as extensive as some of the other reviews I have written because this amp was sold some time ago but you should get some useful information about exactly how it all worked for me. Please check the news page for updated reviews as they are completed.